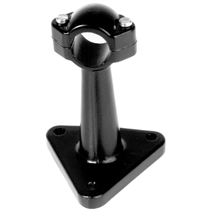 For versions to DIN 16 281 the instrument mounting bracket is designed as a two-piece clamp. With the split clamp of the other versions, instruments with fixed lines connected, e.g. diaphragm seals with capillaries, can also be easily mounted in the bracket by feeding them in from the side and clamping them. The instrument bracket has a 30 mm diameter to hold the pressure gauge directly around its 22 mm square shank. No additional adapter is required.